How can a service provider in the AEC industry improve customer satisfaction and loyalty? Is it necessary to satisfy all customer demands as perfectly as possible? The Kano model helps in finding answers to these burning questions. In the 1980s, Professor Noriaki Kano created a theoretical model for product development and customer satisfaction. The model has two dimensions: customer satisfaction and the ability of a product or service to meet customer needs and expectations. Kano’s customer satisfaction scale ranges from “totally dissatisfied” to “delighted.” In the middle of the extremes, the customer is indifferent or neutral. The service attributes scale starts from “not implemented” and reaches “fully implemented” at the top. The three other quality groups are indifferent, unclear, and reverse (the customer expects that these attributes are not present in the service). These attributes are self-evident, at least in the customer’s mind. The customer does not ask for them specifically, as she expects them always to be there. For example, a contractor’s client would expect the contractor to clean up the building site after project completion. If the contractor did not do so, perhaps by referring to the contract agreement, the client would certainly be dissatisfied. These attributes affect customer satisfaction linearly: the more, the better. It is easy for the customer to describe and measure one-dimensional attributes. For instance, if one painter can do the job more quickly than another painter, the customer is likely to choose the first craftsman, provided the price is reasonable. The customer does not expect delighters, but they can make her satisfied. These attributes are often the decisive factors that make the company stand out in competition. These can be anything from an extended guarantee to a mobile app. You can examine Must-be factors with market studies. One-dimensional attributes can be identified with surveys, but ethnographic research is also a great way to study these. The most difficult task is to come up with delighters. It requires creativity and sometimes risk taking. Tests, prototypes, and trials with forerunner customers are all valid tools for evaluating delighters. 1. How satisfied would you be if the service has this feature? 2. How satisfied would you be if the service does not have this feature? Must-be attributes are typically those which the customer evaluates as neutral in the first question and unsatisfied in the second. The rest of the attributes are either One-dimensional or Delighters. To find out their real value, you can ask the customer how much more she would be ready to pay if the service had these features. Remember that the “don’t care” answers cannot be removed right away even if the customer does not explicitly recognize their value. 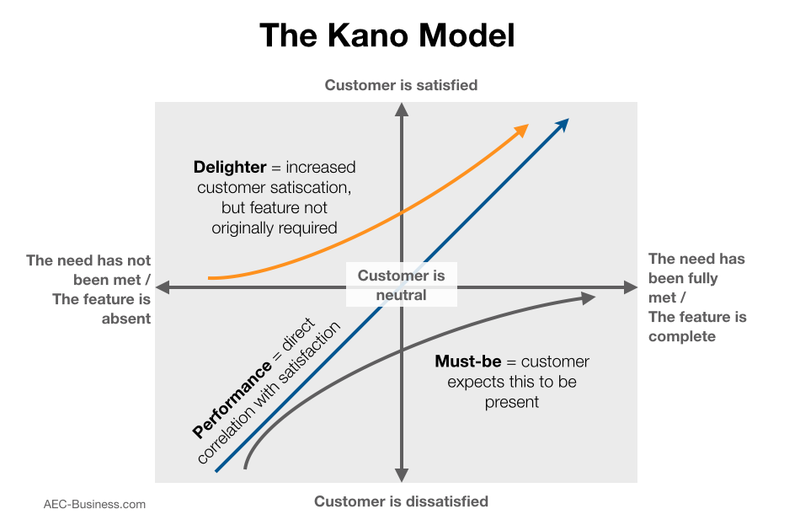 The Kano model is not static. Today’s One-dimensional features will probably become tomorrow’s Must-be features. In some markets or customer segments, even a Must-be can improve customer satisfaction. If you don’t meet the customer’s expectations right away, you may get a second chance. However, if you fail to meet the basic need, you’ve lost the game.